Port Blair, Sept. 2: In an unprecedented incidence at Sippighat Junction, an IRBn Jawan killed a 22 year old civilian Brijesh Das, using his service rifle. The incident took place today noon when the accused Rana Paul, Constable in the India Reserve Battalion (IRBn) while on duty was under the influence of alcohol. 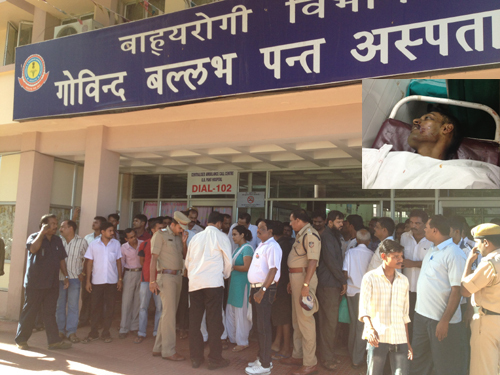 Brijesh was shot on his chest to which he succumbed on the spot. Sources inform that Rana Paul knew the victim Brijesh Das, S/o Kartick Das well and had taken an amount of Rs. 1.15 Lakhs from him, assuring him a job in the battalion. But when Rana could not keep up his words, Brijesh started demanding the money back. It is learnt that Rana had returned a part of the money and called Brijesh to the spot today, on the pretext of returning the remaining amount. The incident of broad day shooting by IRBn personnel on duty had sent shockwaves in and around the Port Blair city. Hundreds of people including the Member of Parliament, Shri Bishnu Pada Ray gathered at GB Pant Hospital where the body of the deceased was kept; all demanding justice. The matter became so heated that minor incident of stone-pelting on vehicles was reported at Sippighat, to which the police had to act sternly. It was later in the evening at around 6.30 pm, an FIR was registered by the victim’s father, under close monitoring of the Inspector General of Police, Shri Sanjay Singh IPS and Commandant IRBn Ms. Aslam Khan, IPS. Meanwhile, the PCC President Kuldeep Rai Sharma expressing his shock over the tragic news has demanded the Lt Governor for stringent action against Rana Paul for his inhuman and brutal action. He has also demanded for immediate financial compensation and regular job to the next kith and kin of the deceased.